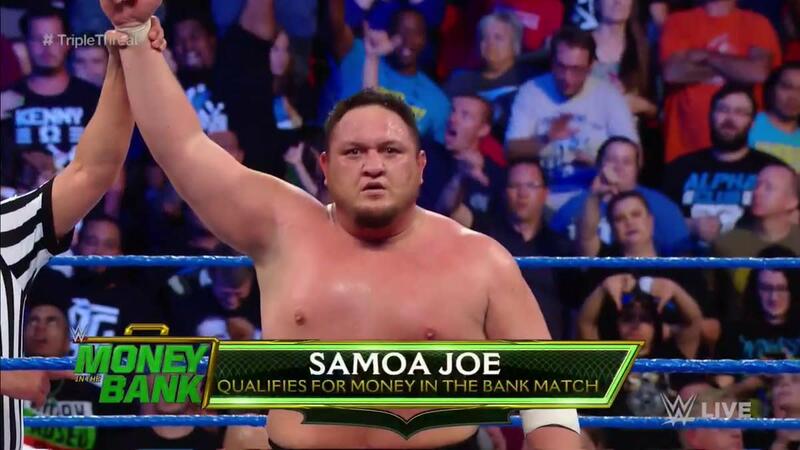 While WWE changed this week's advertised Daniel Bryan vs. Samoa Joe match, Joe still became the final person to qualify for Money in the Bank. Bryan passed out in the Coquina Clutch in tonight's main event, which became a triple threat match when Big Cass was added to it. Bryan hit a running knee on Cass and was going for the pin when Joe choked him out. After the match, Cass hit Bryan with a big boot. Cass interrupted Joe and Bryan at the start of SmackDown, said their match wouldn't be happening, and laid them out by using his crutch, throwing Bryan into a ladder, and hitting them with the Money in the Bank briefcase. The triple threat main event was made official soon after that. Joe vs. Cass in a qualifier was originally announced for last week until WWE pulled Cass due to what they claimed was an injury. Braun Strowman, Finn Balor, The Miz, Rusev, Bobby Roode, Kevin Owens, a member of The New Day, and Joe will be the eight wrestlers in the men's Money in the Bank ladder match. Ember Moon, Charlotte Flair, Alexa Bliss, Becky Lynch, Natalya, Lana, Naomi, and Sasha Banks are set for the women's ladder match. There are two weeks of television left before Money in the Bank takes place on June 17th.